When you create a role and configure access permissions, you need to test your role settings to ensure that users in that role can see and do exactly what you want. Tip: You can also test your app as a specific user. When you're finished testing, you can easily return to your former role. When you temporarily change your role, you see only what users in that role see in your application: including the app Home page, the list of available reports, and the records and fields that users in that role can view and modify. When you test as a role, you use the app, so any changes that you make while testing are applied to the app. Exception: If you belong to a Quick Base group with Admin; Admin, Sharing; or Basic, Sharing permissions, some of those permissions may be retained during the temporary role change. In this case, we recommend using one of the other ways listed above to test role settings. Multiple roles: If you belong to multiple roles and temporarily change your role, you belong to the temporary role only until you return to your former roles. For example, if you are in both Project Manager and Team Member roles in the application and temporarily change to a Viewer role, your only role in the application is Viewer while you test the application. Group membership: If you have shared your application with a group remember that groups can be assigned roles and permissions too. Note: The Everyone on the Internet option is just a group within Quick Base; one that allows people who aren't signed in to Quick Base to view data in your apps. See the exception noted above if you are testing a role while part of a group with Admin, Sharing or Basic, Sharing permissions. Target Group membership: A Target Group is set per user on the Manage Users page and specifies which group's records you can see or modify when you are in a role whose View Records and/or Modify Records table permission is set to Group's Records. If you change to a role in which a table's permissions are set to Group's Records, you will not be able to view or modify records in that table. If you set the Target Group for your user while in a temporary role, Quick Base does not support that action, and automatically returns you to your former role. Click the user dropdown on the Global bar. Next to Test this app as, click A Role. Select the role that you want to test from the list. You are now using the application in the role you select. A message appears at the top of the page indicating what role you are now using, and remains at the top of the page until you return to your former role. 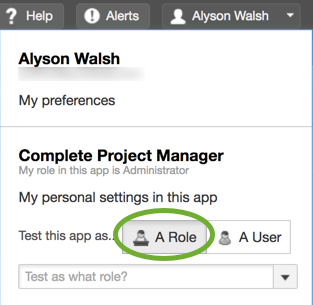 Your Role on the user dropdown shows the temporary role while you're testing, but your role assignment on the Manage Users page remains your former (original) role. Note: You can always test as a specific role, even if the ability for app admins to test as a specific user has been turned off for your account. Click End Test to switch back to your former role. If you had multiple former roles, you return to all of those roles. If this happens, Quick Base automatically returns you either to your former role or to the new role to which you have been assigned. You or another application administrator copies the application in which you are using a temporary role. You remain in your temporary role in the original application. However, Quick Base returns you to your former role in the new copied application. You remove a table from an application by moving it to a new application while you are using a temporary role. You remain in your temporary role in the original application. However, if you create an app, you have full admin permissions in the newly-created app. You create a sandbox of the application. Quick Base returns you to your former role in sandbox application. If another application administrator changes a sandbox application and then applies those changes to the live application, you are returned to your former role in the live application. If the sandbox changes include changes to your role, those role changes are applied automatically when the administrator applies the sandbox changes to the live application. Create a secondary user account, either by creating a new user profile or by registering for Quick Base with an alternate email address, like your Gmail or Hotmail account. Share the application with your alternate account in the role you want to test. Sign out and sign back in as your testing persona. Access the application and make sure you see what users in that role should see. Ask a few potential application users to test the application. Share your application with them in the role you want to test. Watch over their shoulders as they navigate your application. Make sure they see what you want them to see. Also, take this opportunity to get feedback on your application. Do your testers find their tasks easy to accomplish? Does your setup make sense? Could you design the application differently to help them out? Use their feedback to make changes. The more people like your Quick Base application, the more likely they are to use it. Guide your users by annotating your data-entry forms with help popups that tell users how to enter information. Also, customize your app's Home page to include instructions and quick links to important features. You can even write a guide for your application. Let Quick Base help you compose an attractive web page and post a link to it on your application's Help panel.